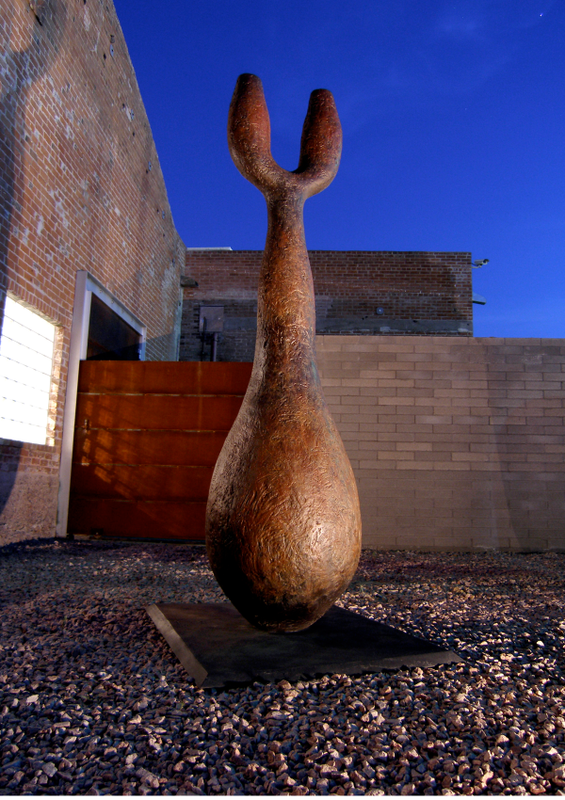 Large Scale bronze cast by artist at ASU Foundry from a small model of a sculpture inspired by a small clay vessel. This vessel that inspired his form was found in a collection of Roman artifacts in Oxford England. When enlarged to monumental form, it becomes imposing and inspiring in its presence. The surface is expressive and an active painterly patina enhances the warmth of the vessel form. In some ways, the form is also reminiscent of desert forms, such as succulent cacti, and it has always seemed at home in the desert environment. The Image was laser scanned from a small bronze sculpture inspired by the Roman vessel, enlarged, and sand cast by the artist in five sections, assembled with an infrastructure. Night view, Phoenix, Arizona.